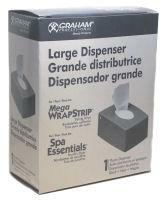 Black plastic dispenser for SpaEssentials Paraffin Strips and Mega WrapStrip styling strips. For convenience and sanitary one-at-a-time dispensing. These exam table papers feature smooth or crepe finish with the trusted quality and comfort you expect from all Graham products. Crepe rolls are textured for added strength, softness and quietness. 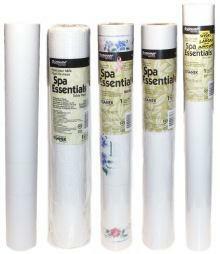 Smooth rolls feature a high quality, smooth finish paper which provides superb strength. Both of these rolls offer performance and value, providing a clean, protected work surface and work environment every time. Poly-backed paper is perforated every 18 inches. Great for Massage or Waxing. Your feet lose more moisture than any other area of your body. Electric mittens will protect and encourage the natural moisturizing agents already in your feet. They consistently insulate and maintain heat during paraffin treatment and promote deeper penetration of oils and lotions to your skin. Comes with High and Medium settings. 40 watts. Designed to fit 14 oz Wax Warmer to prevent dripping of wax onto the warmer. 100% cotton cloth mittens use to insulate and maintain heat during paraffin treatments. They promote deeper penetration of oils and lotions to your skin.